I have mostly recovered from my stretch if illness which made it difficult for me to keep up to date on the blog posts, so hopefully I will be a bit more regular this year! Today I have been making new sculpture for an exhibition I am having in ContainArt which I am installing on the 11th January – YES, it is going to be a rush!! With having being ill and then indulging in Christmas festivities I couldn’t get to making any earlier. 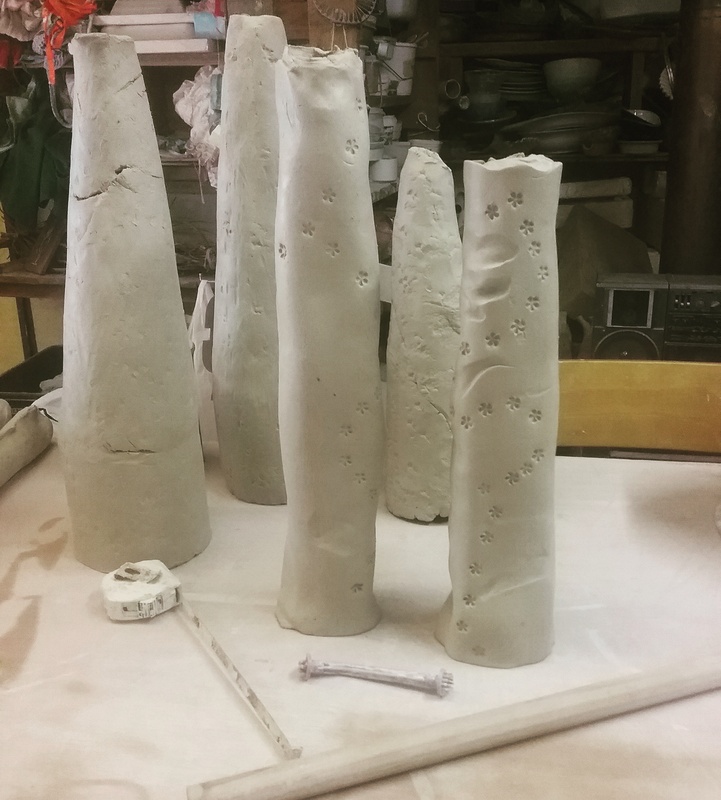 I’m hoping to pit fire some of the pieces and it is fire restrictions time in Australia so I have to apply for a permit – hopefully that comes through OK.
Today in the studio I am creating a new sculpture. It’s been a while since I created new sculpture – not sure why, it seems so many other things get in the way! So why am I creating a new sculpture – some motivation, I guess!! Recently I was invited to create a work for a micro exhibition for the Lorne Sculpture Biennale in response to the bushfires that occurred on Christmas Day in the Wye River area. The brief was positivity and regeneration. I was really pleased to be asked, as only a month before I had experienced a large scale bushfire near my home where some close friends had been affected, but thankfully had kept their house and business, though unfortunately many other homes were lost! And three years ago the mount I live at the base of had been on fire. So, in a way, making a sculpture for the Wye River bushfire also allowed me to communicate the emotions I had felt in response to the other two fires. So with these thoughts in my head as a starting point I started out in the studio with a pre conceived concept, but – of course – ended up with something completely different. Now, this above thought is not be taken lightly, and I am intending to write a post about this in the future Why was I able to change my concept/design on the run? I believe the arts cultivates dynamic thinking which can drive innovation and be flexible upon need…. this is why STEM needs to be STEAM in our education system (*see below). As an attempt to be more regular with my blog (famous last words) I am going to post the occasional “saturday shelfie” – that is, what I am working on currently in the studio (and a play on selfie). Today I am putting the finishing touches on a custom order – a grotesque mug. The commissionee had a slipcast mug which he had for many years and dropped it…. the mug had sentimental value to him and he wanted another one and found me via Facebook! This mug is not slip cast but hand sculpted, and I must say i did enjoy the process. It has been a long time since I sculpted a piece of work in such detail. I used to make dragons many years ago, so it was interesting to recall the feelings and skills of the past. Maybe I’ll explore creating some more sculpture in the near future…. This weeks Sunday Studio is a short one, as I am again not in the studio, but am visiting Shepparton for the weekend. The main purpose of the visit is to see John Perceval’s Angels at the Shepparton Art Museum. I’ll be going there tomorrow -another professional development trip. So for now I will share the cows of Shepparton!! Shepparton is in the Goulburn Valley famous for growing fruit and the Shepparton Preserving Company (SPC). But prior to fruit the first white settlers grazed diary cattle, so Shepparton have over ninety fibreglass life size cows scattered throughout the town, decorated in various colours and designs. Called the MooovingArt Cows Project, the cows change locations and design on a regular basis! Though my partner did not like the cows – “they’re too contemporary” – I thought they were cute and playful, adding a bit of colour and vibrancy to the urban landscape and the parks they are located within. And they certainly catch people’s attention and become talking point. Readers may remember a couple of weeks ago the subject of my Sunday Studio Visit post was about making work for a new exhibition – BLiNG. Well since then the exhibition has been formally opened by Ballarat public arts officer Julie Collins, which was great fun with lots of art lovers turning up, and even a few sales being made. As the exhibition title suggests the exhibition is all about sparkle and glam, showcasing new works by local artist Linda Franklin, Niki J Dai-ko Myo , Melinda Muscat, myself, and introducing the Berry Street-ettes, a group of local teenage girls. Linda’s beautiful icon influenced paintings contain political commentary reflecting on the Western and Muslim worlds, the wearing of the burqa, and the participation of the Obama administration in the Iraq and Afghanistan wars, and the divers range of ‘bling’ moments in life; Niki’s ornate animal skulls revisit her childhood experience of being a city child moving to the country and the sudden exposure to the harsh reality of death within the landscape. Melinda’s work, as always, is full of colour and layers of extravagances. The Berry Streetettes explore the sub culture of graffiti and street art by BliNGing up used spray paint cans. As for me, my work is content-LESS – purely about the fun of creating, something I don’t think I have ever actually done before! Its a great exhibition and well worth a visit, amd this is last weekend to see it!!. So, if you are in or around the Ballarat area head over to Wolveschildren Artspace.